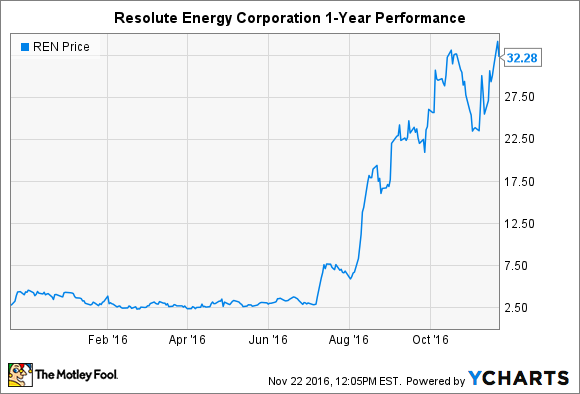 2 Signs You Should Sell Resolute Energy Corp. Improving operations and higher oil prices have pushed the stock up over 1,000% in the last year. It's time to sell. Investors have no doubt been enjoying the meteoric rise of independent oil and gas company Resolute Energy Corporation (NYSE:REN). Meteoric may be an understatement. The stock has gained over 1,000% in the last six months -- nearly enough to reverse an equally impressive collapse that occurred at the end of 2014. At the time, oil prices went cliff diving, taking many oil stocks along for the ride. Today, Resolute Energy Corp a string of good news higher. In addition to rising oil prices, the company has renegotiated off-take deals for more favorable pricing. It has also sold off chunks of assets to pay down debt and double down on the promising potential of the Delaware Basin. The oil formation is part of the Wolfcamp shale, which the U.S. Geological Survey recently estimated could hold 20 billion barrels of oil -- the largest continuous oil play ever in the United States. While the Delaware Basin was excluded from the new estimates, investors are betting that its inclusion in the Wolfcamp bodes well for the company's future. Despite the improvement in operations and the potential Resolute Energy Corp. to take advantage of higher energy prices with its new Delaware Basin assets, investors should take a step back and consider these two signs that now is the time to sell the stock. Resolute Energy Corp.'s balance sheet at the end of the third quarter of 2016 was a minefield. The debt-to-assets ratio stood at 1.75, meaning the company had $1.75 in debt for every $1 in assets. Shareholders' equity dropped to an all-time low of negative $339 million. To be fair, most balance sheet metrics deteriorated after the company wrote off $628 million in assets last year, but without substantially higher oil prices and production, the company could fall victim to its enormous debt load. The company's debt should be expected to grow as it seeks capital to pay for production increases, but that could be dangerous at currently high levels. In fact, the perilous financial position has already hurt investors since the end of September. Days after the close of the third quarter, Resolute Energy Corp. announced the offering of up to $60 million in preferred stock that yields an 8.125% dividend. While it helped close an acquisition of additional assets in the Delaware Basin, it comes at the steep cost of a relatively high dividend yield and future dilution for existing investors. Will it be worth it? Management has big hopes for its Delaware Basin acres, which could support more than 300 wells at full tilt. While that level of development will take years to achieve, the company is also investing in near-term growth. It will move from nine to 14 wells by the end of this year to provide momentum heading into 2017. It also intends to increase rig count from one to two next year. That said, asset development requires capital expenditures, and capital expenditures have a high cost for Resolute Energy Corp. investors right now. That's not a very encouraging comparison. Every important financial metric has deteriorated since the last time the stock was over $30 per share. It doesn't mean all of the recent gains are at risk of being given back, but it hints that investors should consider selling now before the tide rolls out. Regardless of how you feel about the company's future potential, I think this is the strongest sign yet that now is the time to sell Resolute Energy Corp. Rising oil prices and investments in a promising oil play have investors dreaming about an amazing future for Resolute Energy Corp. But a dreadful balance sheet and a stock price that is outpacing financial metrics should provide a gut check. It doesn't mean that the company cannot fight its way back to relevance eventually, but there's a long, long way to go.